First off, line of the week goes to Cowboy TE Martellus Bennett on team chemistry. "We don’t have a lot of scientists on the team so I don’t think there's anybody doing chemistry in the locker room. Most of these guys left school early, and I don’t think chemistry is anyone’s best subject." Congratulations Melky Cabrera. At this point last year, you were batting .242 and looked like you were on your way to flaming out. Now you join Joe DiMaggio, Mickey Mantle and Bobby Murcer as another Yankee CF who has hit for the cycle. Great comeback, Melk. After Cliff Lee throw 5 -1/3 innings of no-hit ball in his first outing as a Phillie, you gotta think that the Phils right now have overtaken the front-runner position to be the NL representative in the World Series. Hamels (who you know will eventually get back on track), Lee and Happ. In a short series, that's a tough rotation for any team to face. Nice timing, Cleveland. 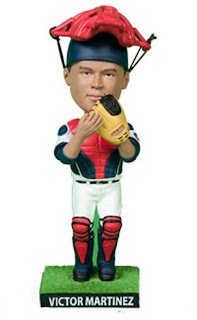 The Indians scheduled this past Saturday as Victor Martinez Bobblehead Night—a day after they traded him. Why don't the Red Sox have Babe Ruth Appreciation Night while we're at it. How's you like to be Jerome Phillips or Brad Cottam. Respectively those are the guys replacing Derrick Brooks and Tony Gonzalez. Which would you rather be? Phillips is replacing a Hall-of-Famer who's be the leader of the Bucs defense since seemingly the Carter Administration. While Cottam only has to take over for the best pass-catching TE of all time. Good luck to you both, fellas. While we're at it, why don't the Bucs trade one of the 14 TEs they have on roster? New OC Jeff Jagodzinski is not the hugest proponent of TEs anyway, so why not trade Kellen Winslow or Jerome Stevens and get something in return. Gotta like Pirates GM responding to all the critics saying he's making too many trades: We don't feel like we've broken up the 1927 Yankees." True that. I mean, there was no chance at all with the guys they had, and their farm system was rated as one of the worst. you may as well try to rebuild your system and get something you can look forward to. And finally, you just gotta give props to is Michael Phelps. Last week, his arch-rival, Milorad Cavic basically bee-atch slapped Michael Phelps before their big showdown on Saturday. See Cavic, and most everybody else, is using a high-tech Arena X-Glide swim suits that boosts your time almost exponentially—43 records were broke in 8 days. Phelps does not. So Cavic—in a moment of lunacy— decided to rank on Phelps, saying he would buy Phelps an Arena suit, so that there would be no excuses when Phelps lost. So you can guess what happened. Cavic broke a world record, breaking the 50 second mark with a 49.95 time in the 100-meter butterfly—the second swimmer ever to do that. Unfortunately for Cavic, Michael Phelps was the first. 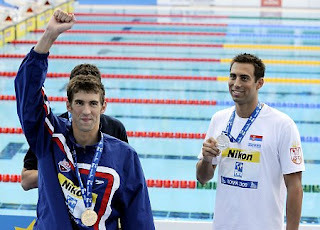 Phelps had a time of 49.82 beating Cavic, a time to which Cavic could only smile and shrug his shoulders. "He's the Man," Cavic said. RE:Martellus Bennett - It also amused me on how he was glad the Cowboys were practicing in San Antonio this season instead of California as this would prepare the team for the Texas heat. Except they practice inside the Alamodome in S.A. Oops. The Pirates may not be the '27 Yankees, but isn't the GM responsible for putting that team together? like him or hate him, Phelps did what you hope all elite athletes do in crunch time. Shut up and beat the other guy. Tip of the cap to him. Agreed, Travis, but I believe this guy is only on the job like 1 year and a half. With a lousy budget. I'm hoping he can turn it around. It used to be a great baseball town. And yeah, you gotta give Phelps props.